Born 14 October 1888, Wellington, New Zealand, to a prosperous merchant family. In August 1908 she arrived in London with her cello, which she continued to study for two years before turning decisively to writing. Her first stories were a homage to the Russian storywriter and dramatist Anton Pavovich Checkov, whose work she knew primarily through Constance Garnett’s translations. In 1910 A. R. Orage featured several of her pieces in The New Age. In 1911, KM began to collaborate with the critic, editor and publisher, John Middleton Murry. A vivacious, articulate, intensely questing and unconventional spirit from the colonies, Katherine stormed London’s social, literary and intellectual scene as the world went to War. She and Murry married in 1918. KM’s tempestuous friend – the novelist D. H. Lawrence, as well as the example and friendship of Bloomsbury novelist, critic and journalist Virginia Woolf also proved significant influences. 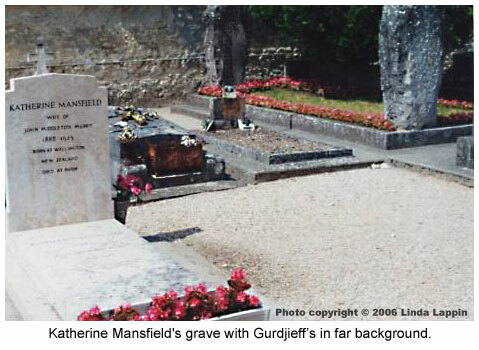 Katherine was welcomed and closely cared for by Gurdjieff and company. He enlisted Olgivanna, Adele Kafian and Rose Mary Lillard-Nott to attend to her, then arranged construction of a Persian carpet draped loft for her, over the stalls of the dairy barn, complete with divans, then had the artist Alexander Salzmann decorate the whitewashed walls with colourful designs and cartoons. It was a favourite spot for both Gurdjieff and Katherine. She chatted daily with the milkers and her stream of visitors, and doted on the cows. Gurdjieff himself—when his frantic schedule permitted—enjoyed lounging there. His was an elegant but dangerous generosity—given the risk of TB transmission, either air-born or via their milk supply—but with no apparent medical ill consequence for members of his community. KM’s correspondence during her last few months, vividly demonstrates that despite her fragile condition, she was exhilarated by life in the community where she chose to end her days. 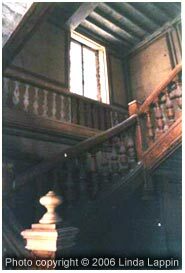 Late on the evening of January 9th, 1923, Katherine Mansfield collapsed from an abrupt lung hæmorrhage, on a staircase at Murry’s side. She died 30 minutes later, with Drs. Nicoll, Stjoernval, and Young in prompt attendance. (1)	Linda Lappin The Ghosts of Fontainebleau Southwest Review (Dallas) Volume 87, No. I, 2002., p30. (3) C. S. Nott Teachings of Gurdjieff: The Journal of a Pupil (1961), p47. (4) P. D. Ouspensky In Search of the Miraculous (1949) p386. This vivid account of KM's intense final months at Gurdjieff's Institute forms chapter 11 of Moore's 1980 biography Gurdjieff and Mansfield. The French article presents excerpts from that same chapter. Excerpts between August and October 1922. September 20 and December 31, 1922. Enlisted by Gurdjieff, to be one of Mansfield's companions, Olgivanna was attracted by KM's intense "hunger for impressions" and her burning desire to be a more "completely developed human being." Writing for John Middleton Murry's journal The Adelphi in 1946, Kafian reminisces about her days as a young Lithuanian student at Gurdjieff's Institute, her devotion to Mrs. Murry's "modest" needs, and the intense relationship they developed despite linguistic barriers. An exceptional pianist and leading Movements teacher, Rose Mary Nott was the first American to attend Gurdjieff's Institute. She recalls taking care of Katherine there. Orage describes the final transformation of K M's literary and personal attitudes, which-for her-transfigured the commonplace virtues, making them "as attractive as ordinarily the vices." "I would like you to see the dancing here" Mansfield wrote to John Middleton Murry. "I have never really cared for dancing before, but this-seems to be the key to the new world within me. To think that later I shall do it is great happiness." Some Internet Explorer users may encounter a Network Login prompt when clicking on the Word Document, just click "Cancel". If you do receive this prompt please notify darryl@digital-bliss.ca. The Last Days of Katherine Mansfield. The Adelphi (London) 23 (1), Oct.-Dec. 1946. - The Ghosts of Fontainebleau. South-West Review (Dallas) 87 (1), 2002. - Katherine's Wish: A Novel based on the Lives of Katherine Mansfield, Ida Baker, and John Middleton Murry. Unpublished manuscript, 302p., 2005. -Journal of Katherine Mansfield edited by John Middleton Murry. London: Constable, 1927. 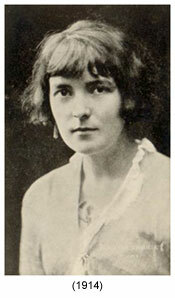 -Katherine Mansfield's Letters to John Middleton Murry 1913-1922 edited by John Middleton Murry. New York: Knopf, 1951. -Gurdjieff and Mansfield. London: Routledge & Kegan Paul,1980. -Gurdjieff et Mansfield. Question de: Gurdjieff texts et témoignages inédits. No. 50. Novembre-Decembre 1982. -Katherine Mansfield and Gurdjieff's Sacred Dance in Katherine Mansfield In From The Margin edited by Roger Robinson. Baton Rouge: Louisiana State University Press, 1994. 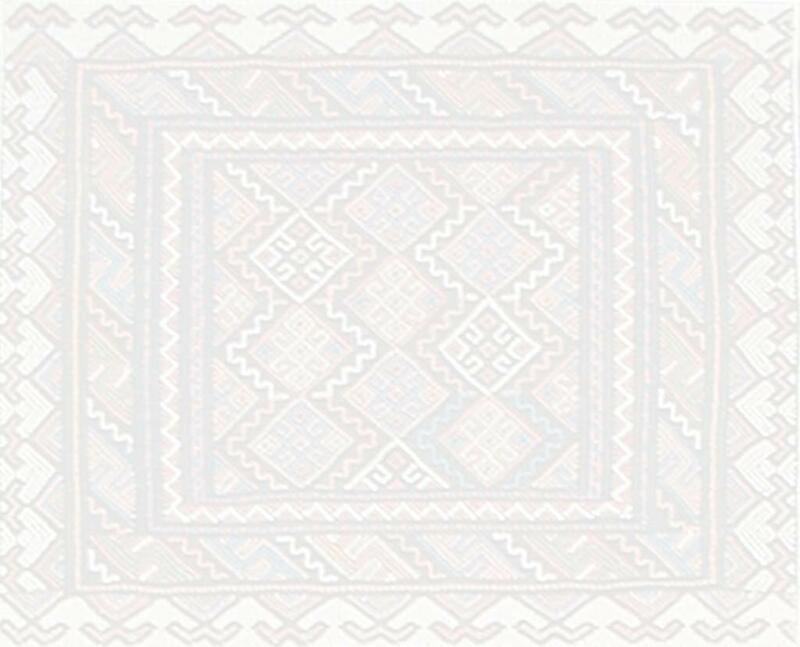 Teachings of Gurdjieff: The Journal of a Pupil. An account of some years with G. I. Gurdjieff and A. R. Orage in New York and at Fontainebleau-Avon. London: Routledge & Kegan Paul, 1961, New York: Weiser, 1962. The Last Days of Katherine Mansfield. The Bookman (New York) 73 (1), March 1931. Talks with Katherine Mansfield. The Century Magazine (New York) 109 (1), November 1924. In Search of the Miraculous: Fragments of an Unknown Teaching. New York: Harcourt Brace, 1949. London: Routledge & Kegan Paul, 1950. Gurdjieff and Orage: Brothers in Elysium. York Beach, Maine, Weiser Books, 2001.